In all aspects of our business, we’re in contact with all kinds of customers — possible customers, probable customers, past customers, favourite customers. How easy have we made it for them to contact us? Many of us that are in business have not made it easy for our customers to contact us. One of the most common mistakes I frequently see is not having your contact information on your website. I visit a website I like and decide I want to talk to that person, through either email or phone, and their information is nowhere to be found. I search and search and finally find the contact page only to find that it’s a form — with no address and no details. The “About Us” page is just as bad with no information. It’s just generic stuff written by a web designer. It means nothing. No phone number — nothing. I want to know there is a real person behind that website. Even your quotes need contact information. When you send a quote out to someone or you send something in writing, have you ever written the words, ‘call us’, or ‘contact us’, thinking that is enough? Even on your website or on other pages, does it say ‘call us’? Ask yourself this — How are they going to call you? Did you list your phone number right there? Now, I know this may sound silly, but your customer is not going to search all over for your phone number. People are lazy these days. When you are talking to someone on the phone and the person you are calling is not available, you usually leave a message, right? Don’t be so short on time that you assume the person on the other end has your number. Take the time to give them the phone number. They might not be able to find it. Let’s talk e-mail for a minute. Now, if you tell a customer “e-mail me”, you might assume that all their information and yours will be listed in each email. WRONG! Make your email address available everywhere — your website, your contact page, your home page, and then in your email, be sure to include your name, phone number, website, and work address. Don’t just assume people know how to use Google. Google is a great place to find your information if someone knows how to use it. Make sure to have your information readily available on Google and Google+. Don’t assume everyone knows how to look up things in iTunes as well. I mean, if you want to find this podcast in iTunes, just go to the search bar in the iTunes store and search for Marketing For Owners. It will then pop up and then you can click on it and click the subscribe button. Once you do, you can also find the ratings button — be sure give us a review. We would love it and appreciate it. Now — look at everything you’ve got, and all the places your customer can find your information. 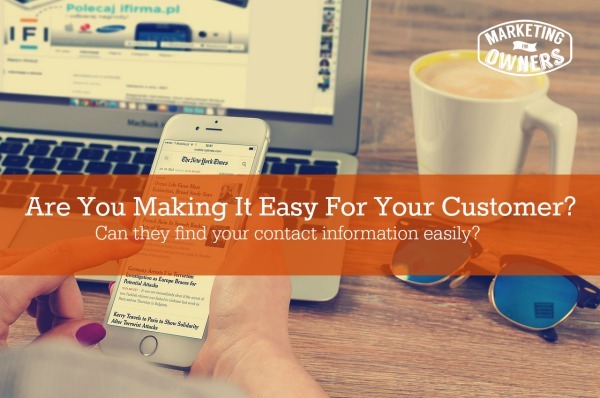 Ask yourself — Am I making it easy for my customer, or am I making them search high and low for my contact information? If they have to put themselves out and put efforts into it, they may not like you quite as much as if you have made it easy. Given a choice, if you were getting three quotes from three different companies, who would you choose? Along with price, the one that makes it easy. 2. Think about where and how you contact your customers. 3. 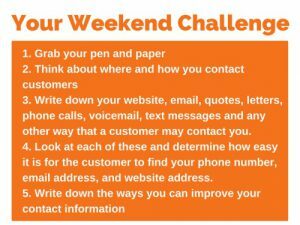 Write down your websites, email, quotes, letters, phone calls, voicemail, text messages, and any other way that a customer may contact you. 4. 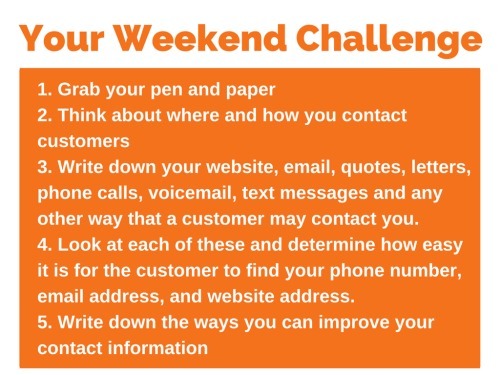 Look at each of these and determine how easy it is for the customer to find your phone number, email address, and website address. 5. Write down the ways you can improve your contact information. Think about it. Look at everything one by one. Get extra contact details in there. One last tip — get a toll free phone number for your business. You will thank me later. Now — go get started on that weekend challenge.